It was a throw away news item: two guys from Pennsylvania snuck into Wrigley Field in the middle of the night—allegedly to steal some of some of the hallowed ivy from the outfield walls. Security spotted them via closed circuit TV and nabbed the culprits. The team, as usual, is not performing well. But the ivy sure is! What a great brand extension for the Ricketts family, new owners of the Cubs. Stop investing in the lousy ball club. 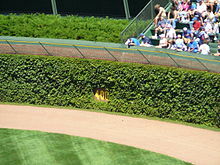 Start investing in selling cuttings from the sacred Wrigley Field ivy. And the Cubbies could add an additional brand extension, a fertilizer—maybe VeeckOrganite— named after Bill Veeck who famously planted the ivy in 1937 when his dad was general manager of the Cubs. Here’s a tutorial on how to nurture ivy clippings. And as an added bonus, here’s a tagline for the brand extension.